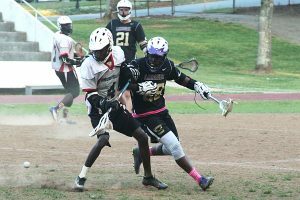 A budding lacrosse rivalry could be building after the Lakeside Vikings scored a 7-6 sudden death overtime victory over the Druid Hills Red Devils on Monday night at North DeKalb Stadium. Druid Hills, which had led 4-2 early in the second period, rallied in the final 10 seconds of overtime at Tyrique Robinson scored his third goal of the game as the clock ticked down to 2 seconds to play to knot the game at 6-6. Lakeside only needed 24 seconds to end the game in overtime as Lucas Winter scored his fourth goal of the game with the game winner at 3:36 remaining for the 7-6 victory. The first quarter of the game featured five goals as Robinson opened up the scoring for Druid Hills on an assist from Believe Soke with 9:50 left in the period for a 1-0. Lakeside knotted the game at 1-1 just 48 seconds later in a crowd in front of the goal. Palmer Cornwell put Druid Hills back ahead 2-1 on a goal with 5:05 left in the period. The Vikings were able to knot the game again with 3:42 still remaining in the quarter on a goal by David Vick. Robinson sent the Red Devils into the second period with a 3-2 with a goal at 2:16 mark of the first quarter. Josh Davis hit a goal with the assist from Cornwell with 8:56 to play in the first half for a 4-2 lead for the Red Devils. Winter put the Vikings on his back in the second quarter scoring goals at the 5:32 mark and with 2:05 left in the half to send the game into the half knotted at 4-4. The Vikings went to Winter again early in the third period as he struck for the go-ahead goal with 11:45 to play in the quarter for a 5-4 Lakeside lead. 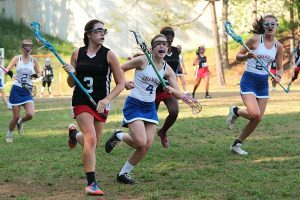 The game remained a one-goal lead for the Vikings until early in the fourth quarter when Druid Hills Willie Jordan wound his way in for a score with 8:57 to play in the game. Lakeside regained the lead with 2:37 remaining on a Vick’s second goal of the game.